The whole manifesto can be read here. Despite relegating the green agenda to the dustbin of history, as GWPF put it, the manifesto claims a couple of times that the UK is at the forefront of global action against climate change. The manifesto remains committed to the 80% emissions reduction by 2050 enshrined in the Climate Change Act, but unlike the Labour and LibDem manifestos, there is no unrealistic 2030 target. Tags: energy, politics. Bookmark the permalink. I think the UK has needed a common sense reset on many fronts for a while now. I thought that the 2009 crash would have done it but althought it helped, too many of our leaders were of the money to burn class. AGW hysteria is a rich man’s obsession. While I hope Brexit will go well, we need the uncertainty to remind everyone what is most important. Better education, lower energy prices, smarter decision making and living within our means. Tentatively I think this budget is on track for that. Although it’s painful, it’s easier now than later. is unrealistic, given that our costs are currently among the highest in Europe. The same point is discussed here. Expansion of offshore wind energy. No commitment to nuclear, the only sensible zero carbon energy source. No repeal of the ludicrously self-destructive Climate Change Act. Pathetic. No change of direction at all. 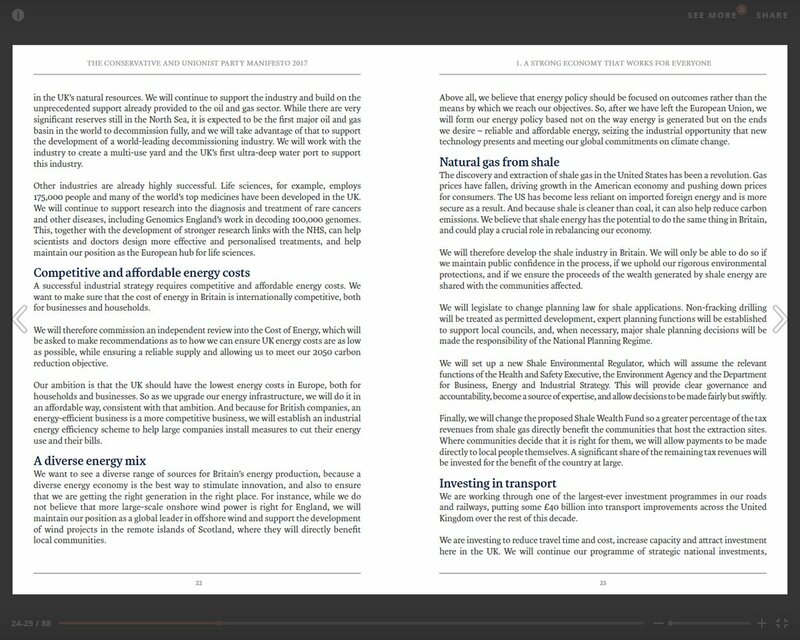 With the current exorbitant cost of energy in the UK, I have no doubt whatsoever that it must have cost many thousands to generate the vast amount of hot air which went into producing this Tory manifesto. I won’t be voting for this nonsense. This month’s ‘Prospect’ has lots about the election. I haven’t yet found a mention of energy policy. Can it be that climate change is not the most important challenge facing the human race?